Machiavellian lecturer Micky Rosa (Kevin Spacey) tempts brilliant Harvard students into a lucrative gambling scam in Las Vegas, in an adaptation of Bringing Down The House by Ben Mezrich, who also wrote The Accidental Billionaires on which David Fincher’s The Social Network was based. The main setting, of course, is the Boston area and the scene is set with student Ben Campbell (Jim Sturgess) cycling north on Harvard Bridge from Boston’s Back Bay toward the domes of the Massachusetts Institute of Technology, then back across the prettier John W Weeks Bridge, taking an oddly circuitous route to an interview at Harvard Medical School. The grand pillared frontage is the school’s Gordon Hall on Shattuck Street. 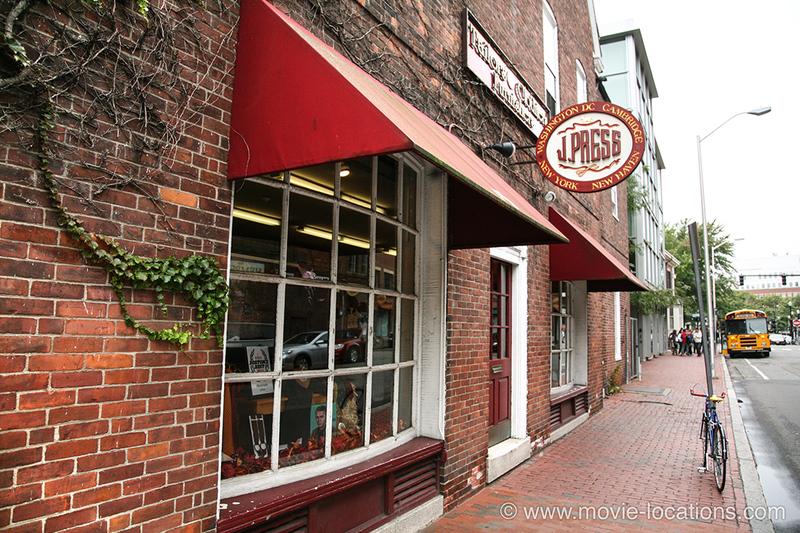 To help pay his college fees, Ben takes a job as assistant manager at J Press, 82 Mount Auburn Street, at Dunster Street, a block south of Harvard Square in Cambridge. Life looks good as he celebrates his 21st birthday at Doyle’s Braddock Cafe, 3484 Washington Street, in Jamaica Plain, a few miles southwest of Boston. 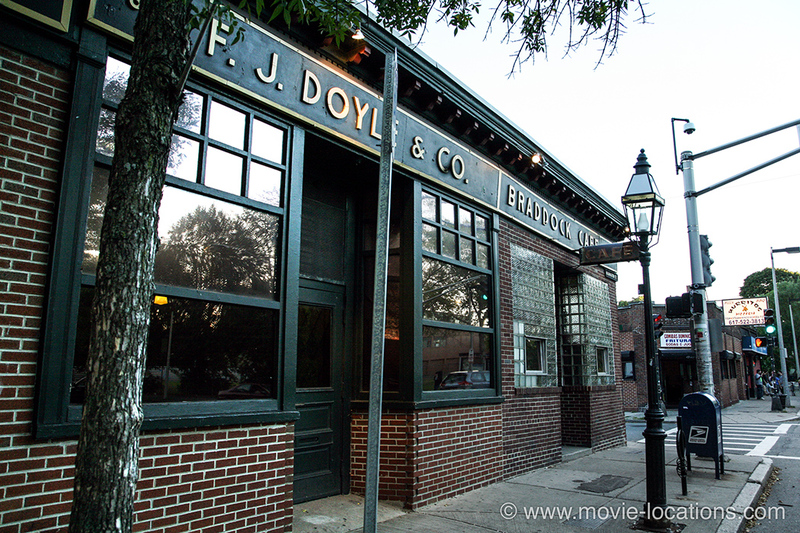 Doyle’s can also be seen in Clint Eastwood‘s Mystic River and William Friedkin’s 1978 caper movie The Brink’s Job. After impressing him with his expertise, it’s not long before Ben gets the call to join Rosa’s select class, specialising in the dubious science of card counting. 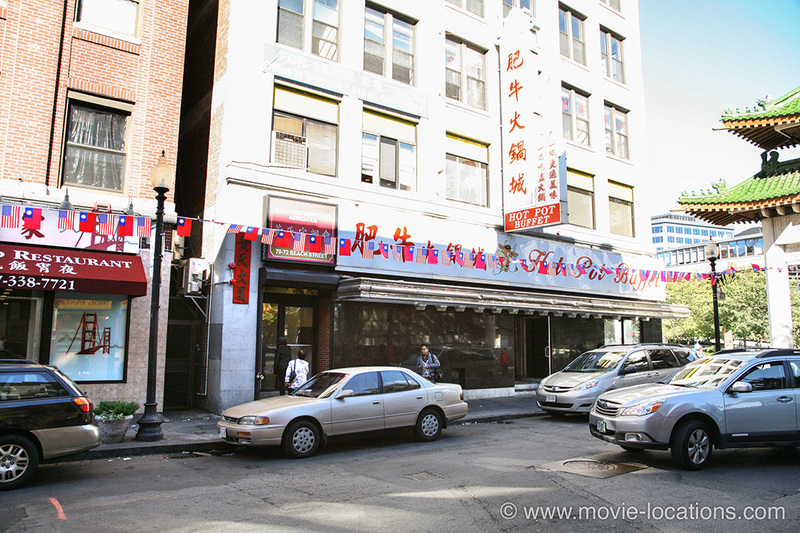 It’s in the South Street Diner, 178 Kneeland Street, near Chinatown, that the team explains the set up to the new recruit. The Diner (formerly the Blue Diner), with its cut-out coffee cup sign, was built in 1947 to serve local factory workers, but has become something of a local landmark as an after-hours hang-out. 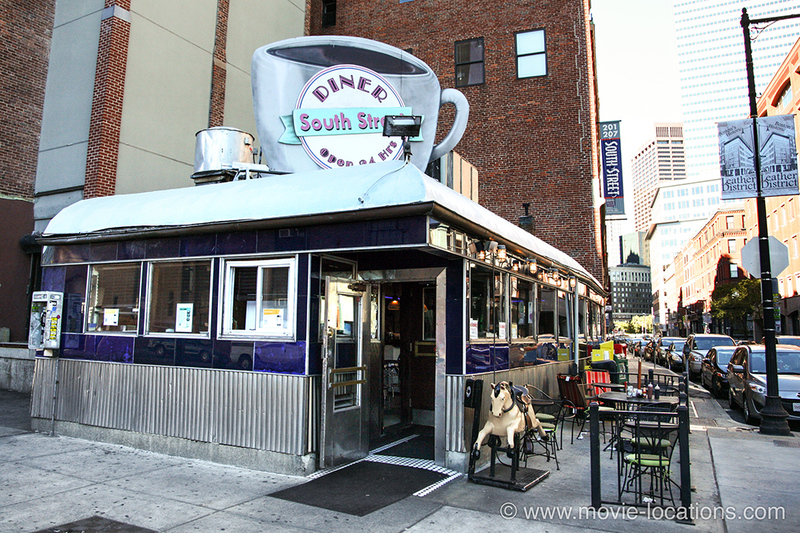 You can see the diner again in 1987’s Hiding Out, with John Cryer and 1992’s HouseSitter with Steve Martin. 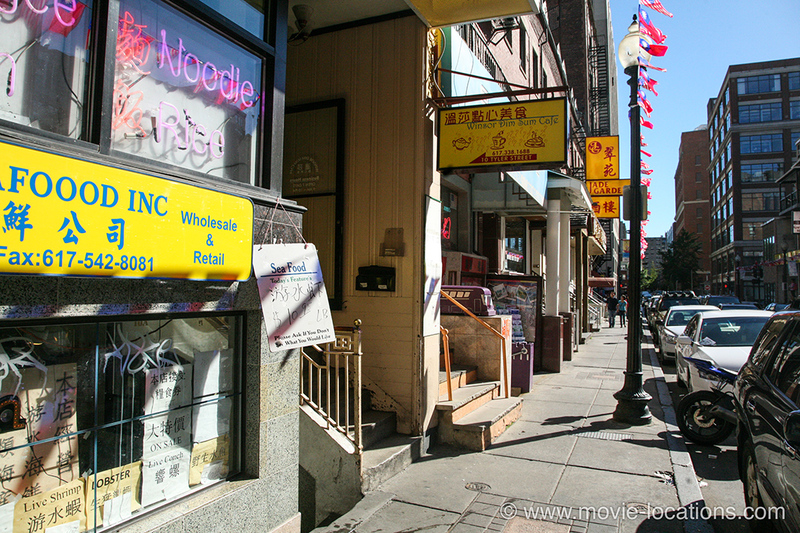 Ben is sent on a trial run in Chinatown itself. He strolls down Tyler Street, looking for the secret location, nervously entering the darkened alley between the restaurants at 68 and 70 Beach Street. Passing the nerve-wracking test with flying colours, it’s walking back along Tyler Street that Rosa reminds Ben that they counting cards – and not gambling. The crew heads over to Las Vegas to put the scheme into practice, staying at the Hard Rock Hotel, 4455 Paradise Road at East Harmon Avenue. They’re soon raking in serious money. 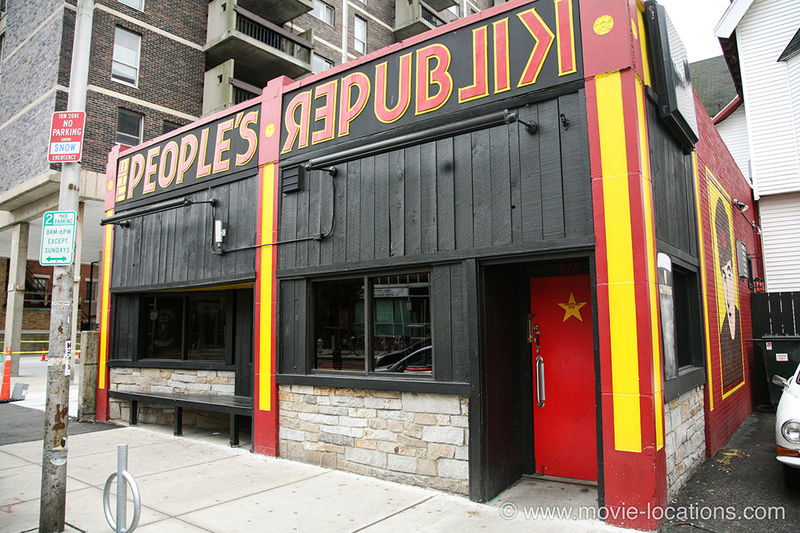 Back in Cambridge, the retro-Soviet style People's Republik, 878 Massachusetts Avenue, is the student bar in which the newly-cool Ben’s somewhat geeky friends are amazed to find he’s a friend of Jill (Kate Bosworth). With a horrible inevitability, the flow of easy money begins to affect Ben’s judgement and, at the Red Rock Casino, 1011 West Charleston Boulevard, in Vegas, he misses the crucial signals and carries on gambling – losing $200,000. 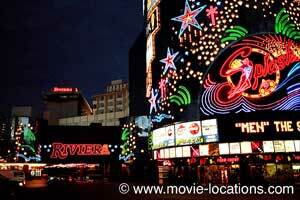 Micky Rosa is less than pleased, but Ben strikes out on his own at the, now gone, Riviera Hotel and Casino, 2901 Las Vegas Boulevard South – which had been a major location for Martin Scorsese’s Casino and Bond movie Diamonds Are Forever. His Vegas career hits the buffers as Rosa tips off security chief Cole Williams (Laurence Fishburne). 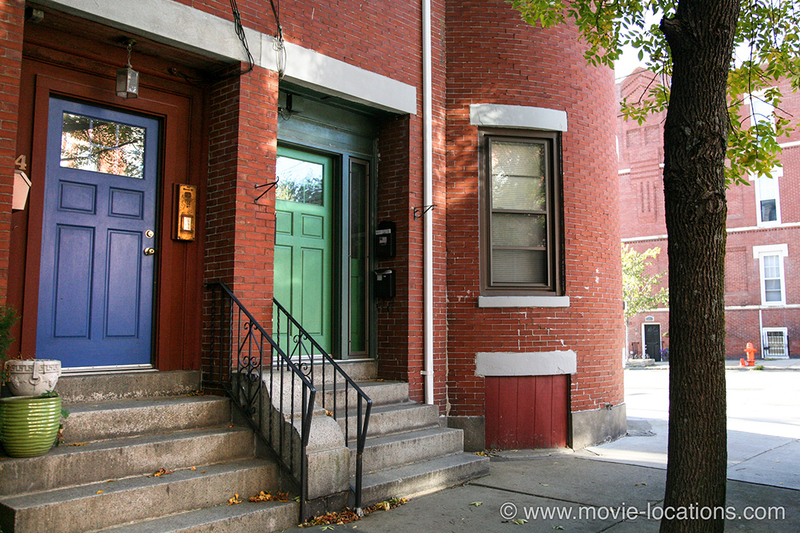 Returning to Boston, broke and chastened, Ben goes to visit Jill at 42 Beacon Street at Broadway, in Chelsea, just over the Tobin Memorial Bridge. Her house is just around the corner from the apartment of fun-loving party animal Ted, and the auto repair business of Cameron Diaz in Knight And Day. Now it’s Ben’s turn to tempt Rosa back to Las Vegas for one last big job, at Planet Hollywood, 3667 South Las Vegas Boulevard, and the final set up.